Koh Kood offers its visitors plenty of options out on the water and or indeed under it, with some terrific diving and snorkeling on the local reefs, as well as excellent fishing further out at sea. Koh Kood diving is well served with three good companies, BB Divers, Koh Kood Divers and Paradise Divers, newly discovered local dive sites and easy access to the Marine Park at Koh Rang and the wreck off Koh Chang. Additonally, off the main beaches such as Bang Bao Beach, the waters are nice and shallow with only weak currents, so making it an ideal place to learn. 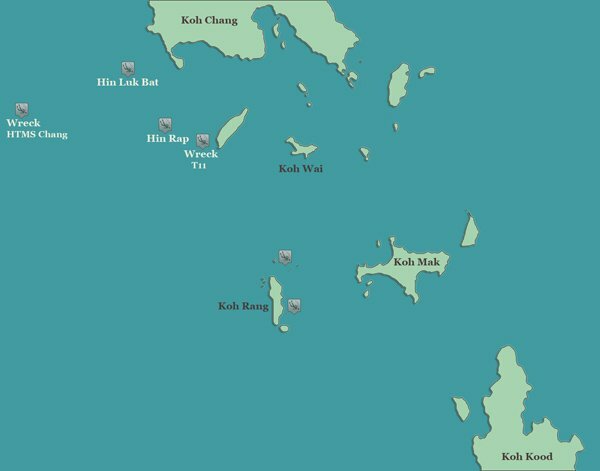 Koh Kood has a great selection of different dive sites on both the west and east coasts. Off Ngamkho Beach, Hin Yedhi (14m) offers dives from 4m to 14m, while connected to it, Ao Tum is a drop dive onto a large coral garden. Heading south down to the Ao Takian area, the rock pinnacle, Hin Loy, has dives to 16 metres, caves and swim-throughs. Around the corner into the next bay, Klong Hin Reef or Anemone Bay is 2 dive sites, depths of 12 metres. In the north west, offshore from Klong Yai Kee, the tiny uninhabited island of Koh Raet has two sites, one at either end. With depths of 4 to 8 metres, the northern end is perfect for beginners, whilst the southern end allows dives down to 14 metres – look out for the harlequin sweetlips and humphead parrotfish. Further north, the so called Soneva Reef is one side of the larger island Koh Maisi Lek, with a deeper dive site on the other. 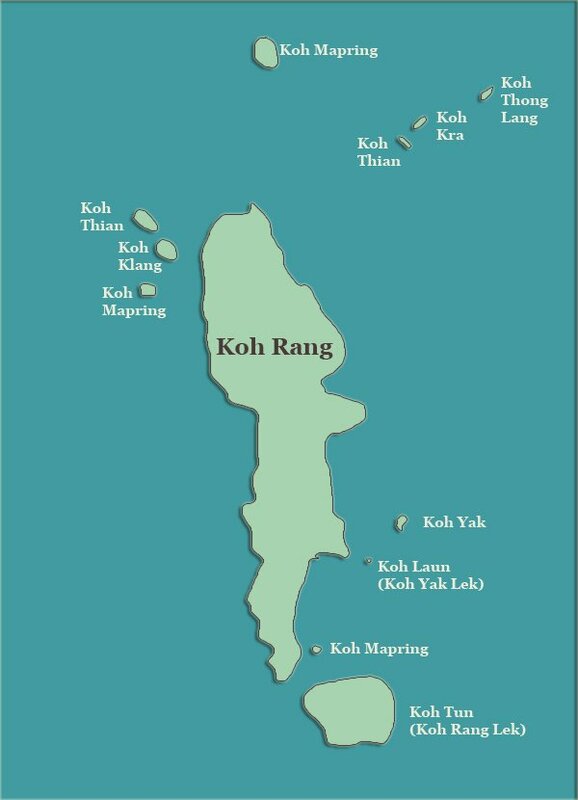 On the east coast, the fishing villages are home to a couple of good Koh Kood diving sites. Hin Ao Salad is the rock pinnacle in that bay, with dives to 14m, while in the south east, Ao Yai has both both a pinnacle, Hin Ao Yai and a shore dive. Of course, the dive boats also head over to Koh Rang, west of Koh Kood, perhaps the premier dive spot in the Koh Chang archipelago. Last but not least, Advanced PADI divers can explore the largest wreck in Thailand, HTMS Chang, sunk in 2012 and a hugely successful local project. Prices will vary on which site you go to and diving packages are of course available. We are able to help with all your Koh Kood diving questions, so you can pre-book your day or days – please just use the Contact Us page and indicate your dates, what you would like to do, your level and we will get back to you with our suggestions, best company, prices and other thoughts. Most popular are the 1 day Discover Scuba Diving (DSD) to see if you like life underwater and the 3 day Open Water, which gives you the full accreditation for diving anywhere in the world, forever. Prices are consistent across the companies with little aggressive undercutting but companies do offer deals on courses, multiple days of diving, groups and accommodation and prices might go down a little at the end of the main tourist season or during the rainy season. Prices also vary slightly on location, with dives more expensive over at the wreck, simply because it is further. Beach dives are used as needed during the courses. A government tax of 400bt Adults, 200bt Children (foreigners) or 40bt/20bt (Thai Nationals) is levied for visiting Koh Rang and the Marine Park. This fee is not included in the price guide given here. 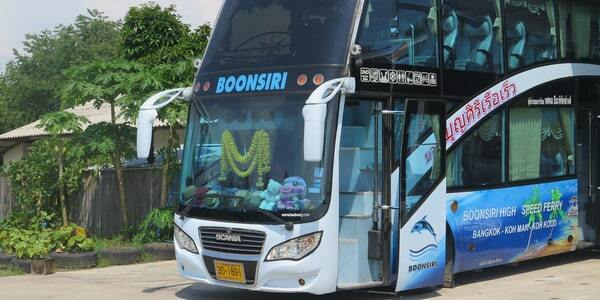 Long established Belgian outfit, with their head office in Koh Chang, operating out of Koh Kood since October 2011. Own large boat, professional friendly staff, well maintained equipment, 5 Star Padi IDC. Dutch father and son operation with long experience of diving in Thailand and in Koh Kood. Own mini reef on their doorstep in Bang Bao and running a coral preservation project. Relaxed set-up with times and schedules to suit. 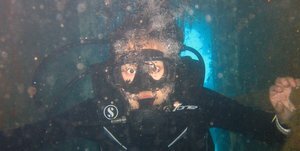 Based on the island since 2004, a German owned company offering all courses, with lots of local knowledge of dive sites. Main base at Happy Days Guesthouse in Ngamkho Beach, but they do have a small office at the entrance to Koh Kood Beach Resort in Klong Mad. There are a couple of companies which provide snorkel and fishing trips, Koh Kood Boat Trip at Doy Homestay and TJ Boats at Mark House, both based either side of the bridge in Klong Chao. Prices are from 500bt for 1/2 days speedboat trips, full day speedboat or private charters – expect to pay 10,000bt for a private day trip to Koh Mak. The boats normally visit two places off Koh Kood, transfer and lunch are of course included. Sunshine Resort on Ao Phrao Beach offers both snorkeling and fishing on 1/2 day trips. Suansuk Speedboats on Koh Mak are also now offering a day trip at 1,500bt from Koh Kood to Koh Mak, 09.30am to 16.30, free share taxi to the pier (Ao Salad or maybe Klong Chao) for departure. On Koh Mak, you whip around on a share shuttle taxi from Cinnamon Resort on the north coast to Koh Mak Resort and Cococape Resort on Ao Suan Yai Beach, ending at Makathanee Resort on Ao Kao Beach before heading back to Koh Kood. You are very much left to your own devices, it’s not a guided tour. You can also snorkel using the dive boats – they go as far as Koh Mak and Koh Chang, though do note that prices will vary according to where you visit. We can organise private charters, private wedding party snorkeling trips, the day trip to Koh Mak – please Contact Us with your requirements. Kayaks are rented out at around 300bt for a half day and this too is a great way of exploring the coastline and mangrove-lined klongs (canals), in particular giving you a different way to access the Koh Kood waterfalls. On the jetty at Ao Salad, Dutchman Fishing Tours, complete with its own small guesthouse, offers full day and overnight fishing tours on its bespoke GPS boat, prices dependent on numbers and destinations. Packages are also available from Bang Bao Koh Chang, ask there at Bang Bao Delight Coffee Shop on the pier. Located in Ao Noi shortly after Klong Chao Beach, the popular restaurant, The Fisherman Hut also organises fishing trips on its boat. Just ask at the counter.